Live Security Platinum is a virus. These kind of viruses are known as malware. The scan results given off by Live Security Platinum are misleading. The warning messages about your computer being infected and that someone is hacking in are false. The program is meant to trick the user into thinking they have been infected with a virus and then to offer the solution as you registering the software. Of course the software cost money and that is how the makers of Live Security Platinum get paid. They are simply tricking or scaring the user to force the operator to make a purchase. The scam is nothing new and these malware clients are prevalent. This program has gone through several variations in the past including Smart Fortress 2012, MS Removal Tool, Smart Protection 2012, Personal Shield Pro and System Progressive Protection to name a few. What is Live Security Platinum? 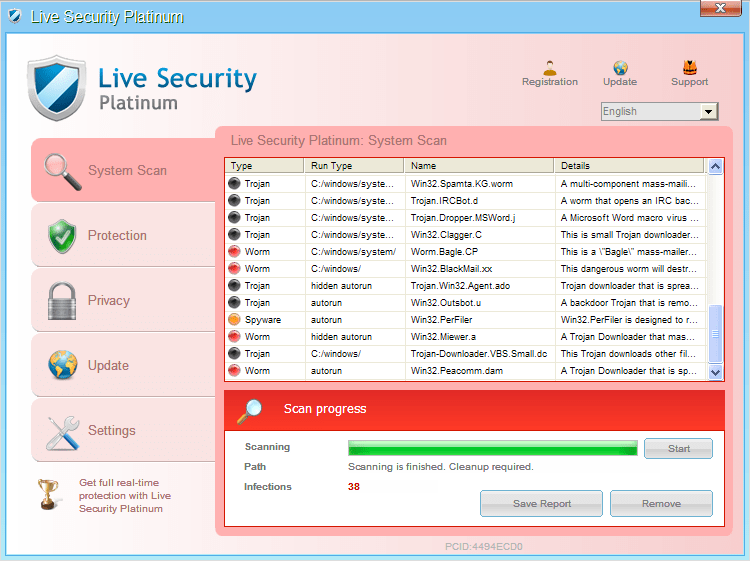 Live Security Platinum is a fake antivirus program.. All the scan results and warnings given off are bogus. How Did I get infected with Live Security Platinum? Too many ways to count how your computer got infected. In many cases these malware clients require the operators help to install. If you were asked to install a program recently then that is the most likely cause. It’s normal for malware to be named a video update or codec. Once the user downloads and install the program they have just actually installed this malware client. There are other ways like visiting a website that is malicious. If you do not have a good antivirus client you may become infected with a virus through something known as a Drive By Download. Many websites are hacked by others and injected with malicious code. The website owner may not even know it. What is Live Security Platinum Doing to My Computer Right Now? At this time removevirus.org does not believe Live Security Platinum is doing any file damage on personal documents. It also is not stealing passwords or banking information. It will block programs from running so you are unable to use your computer. The makers goal is to force you into a corner by not letting you use your computer till you purchase the bogus client. Click here to remove them immediately with Live Security Platinum. Follow the below tips to remove Live Security Platinum from your computer. The how to remove Live Security Platinum guide and video will show you exactly what you need to do. We do recommend Spyware Doctor with Antivirus for an antivirus client. It will be able to fully remove this virus. The trial version is a limited trial. This means it will find the viruses but not remove them unless you make a purchase of the program. It will be able to protect you so you do not get infected with another virus like Live Security Platinum. HELP US: We took the time to make this video and help you. Please take a quick second and hit the facebook like button on the top right for us or write about our website somewhere online to help us grow our user base. Don’t forget. If it’s too hard for you to remove yourself or things just aren’t working for you then a cheap route for repair is www.pcninja.com. Remove Proxy Setting so You Can Connect to the Internet Again. You first goal is going to be able to stop Live Security Platinum from running. To do this we need to stop a single file on your computer. Once stopped this virus will no longer be running. [random].exe ( Example is eAaEmPkGdEd01804.exe ) Your file trace will be named different. A. Browse to the file location shown below and re-name the file first and then restart your computer. Then browse to that file location again and delete the file. C: Log-into another users account and see if you can delete the file. E: Start the Task Manager the very second you login and terminate the process that way. Once you have deleted the above executable, Live Security Platinum will no longer be running. At this time you need to run a full virus scan. RUN THE SCAN!. We recommend wither Spyware Doctor with Antivirus or Spyware Doctor with Antivirus. You need to ensure no other viruses are on your computer. So many people skip this very simple step. Take an extra few min tues and ensure you have all the viruses removed. We do not recommend editing the registry manually. Like with most malware clients the actual removal process can be hard for many users. The makers don’t want it to be easy to remove their software. They want you to purchase it. Once you are able to kill off the main file of this program it’s rather easy to remove. If you want software to protect you in the future we recommend Spyware Doctor with Antivirus because it works to remove and protect you from viruses. PCNinja is the remote computer repair company we like to recommend out. How to Thank Us for the Guide? If we are able to help you out all we ask for in return is you bookmarking our site and writing about us on your blog or facebook page. Posting a comment of thanks goes a long ways as well. Helps to build trust with other users.